The accelerated elementary education program is addressed for children and young adults who have failed to complete the elementary level. Accelerated elementary centers encourage cultural relevance, skills, teamwork, exercise leadership, training to stimulate a productive life and it facilitates the development of skills related to labor demand. These centers stress the key role of reading comprehension and skills development to improve the quality of life, use of technology and initial training base for further learning. FUNCAFÉ during 2015 launched its Accelerated Elementary Education program in two departments: Huehuetenango and San Marcos. This program is designed to complete elementary education in two years, divided into stages: Stage I corresponds to 2nd, 3rd and 4th. grades; and, Stage II corresponds to 5th. and 6th. grades. Accelerated Elementary School program performes educational delivery through specialized tutors in andragogy techniques and flexible mode. Text materials are contextualized and students received personalized attention and pedagogical technical support according to their needs. • Attention to the population living in a school lag or over-aged (13-24 years) who have not completed elementary education. • Significant learning in a period of two years. • Flexible terms for learning. Adjusted schedules to the needs of students. • Insertion of elementary education achievements of adolescents and youth providing personalized attention in their community. The project’s main objective is to increase sustainable economic growth in rural areas based on market demand to reduce poverty and chronic malnutrition achieved by expanding the participation of families in coffee omestic orchard in Nuevo Progreso, San Marcos. 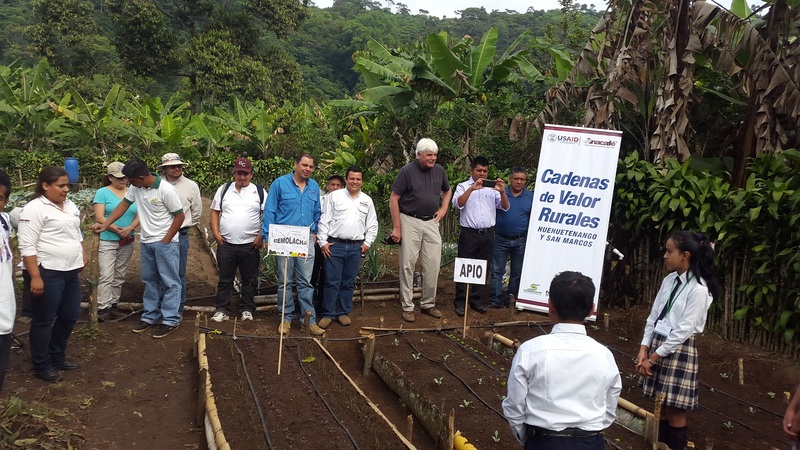 This project is being carried out in 11 municipalities of San Marcos and 11 of Huehuetenango; 26,506 people have been benefited. • 5,134 producers of coffee, vegetables and handicrafts attended. • 4,230 trained persons in food security and nutrition, sexual health and domestic orchards. • 1,216 supported families with wood-saving stoves. • 52% reduction of wood usage for cooking. • 2% reduction of diarrhea in children under 5.